At this time of year with the chilly, wet days and all the festive food around it can be difficult to stay healthy over the holidays. Not to worry - balance is key! Don't worry about sticking to a super clean diet or feeling that you have to pound it out at the gym. Everyone is allowed to let go a little over the holidays, after all this time of year is all about spending time with family and friends. It's also about having a little bit of down time. 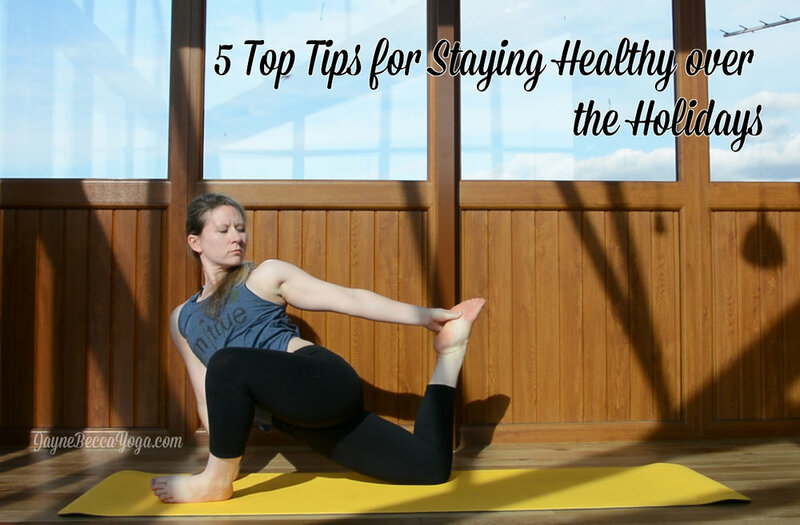 These are five of my tips for staying healthy but still having fun. Have a Healthy Breakfast. I know that chocolate for breakfast might seem like a great idea (we've all been there!) but make a point of keeping breakfast clean and lean. Scrambled eggs are a firm favourite of mine, simple, quick and healthy. It's also a good time of the day to drink a green smoothie or juice to get those much needed vitamins into your system and it's also a good way to keep germs and colds at bay. STRETCH! As much as I love to watch Christmas movies under a pile of blankets in front of a roaring fire I also know that I will feel so much better if I roll out my yoga mat and stretch it out. Even just 15 minutes of yoga practice makes a huge difference to my day. I find that a morning practice works best for me because it puts me in a good frame of mind for the rest of the day. Get Outside. It's not cold at all for the time of year here in the UK so if you can dodge the showers I suggest donning your favourite trainers and heading out for a jog around the neighbourhood or a family walk. One of my favourite places to visit at this time of year is the beach (say what?!) yes I am serious! In Cumbria we live 10 minutes away from St Bees beach. I love the beach in the winter because the salty breeze wakes you up, the sound of the ocean is soothing and I have many a fond memory of galloping down the beach on my ponies and my beloved horse Max when I was younger. If you have a beach nearby I recommend taking advantage! Enjoy Your Food but don't Overeat. I love heading home for Christmas as my Mam makes the most amazing Christmas dinner and I plan on making the most of her home cooking when I am home! Make sure that you enjoy what you have but don't eat for the sake of eating, you'll just make yourself feel ill and there is no point. At this time of year especially I think it's important to listen to your body, stop eating when you are full and don't fill up on chocolates or sugary drinks. Make the most of all that seasonal veg! Water! This is something which I need to remind myself about all the time - drink lots of water. If you make sure that your body is hydrated then it will be able to process and metabolise food faster. Drink a glass of water first thing in the morning, one before each meal and one before you go to bed. At the end of the day don't beat yourself up about taking things a little slower at this time of year. Find balance and have fun!